"Seven Hells! ": Updated: Thor's Comic Column Is A Go! Who doesn’t love a good fight? The sound sections of bones makes while crashing down upon another’s triggers something within us. Something we may not fully understand but something we have come to accept as a part of us. I suspect that’s why we’ve come to love The Batman Family of characters. They’re a family of fighters. Batman, not only is he The World’s Greatest Detective but when he fights the effect is like witnessing a shotgun blast go off in a room. Nightwing, has become a finely honed sword forged by the hands of a true master. Next, there’s Cassandra Cain, Batgirl. Raised as a child by Batman’s former instructor, Cain, she was never thought to read or write, she was taught to kill in the most efficient of styles, reading the language of the body. She was raised to see all of humanity as a series of soft targets and blind spots. Now, she fights for something better, her own humanity. 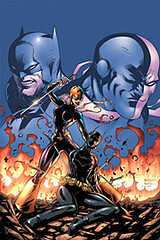 It’s all put to the test as she stares down death, taking on, arguably, The DC Universe’s King Of Fighters, Deathstroke and his daughter, the twisted Ravager. Who will win? Find out in Batgirl #64, on sale now. Want more? You've gotta click on the "Thor's Comic Column" link to get the rest. "Seven Hells!" will be back in full swing later on today.